Head to Fever Pitch Basecamp for a weekend of a paintball game in the jungle, water sports activities like kayaking and canoeing, and getting your adrenaline rush. 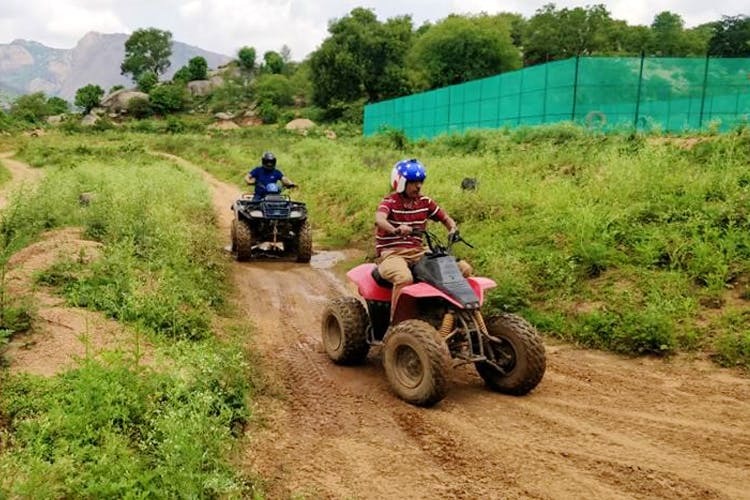 Just off Magadi Road, around 35 kilometres from Bangalore, the base camp is for everyone looking to get their adrenaline rush or just have a jolly good time with their squad. Paintball takes the spotlight with an outdoor arena in the forest, so guys, be sure to go with a game plan. The water sports activities include kayaking and canoeing, and even swimming across the Manchinbele Dam. For those who prefer solid ground, there's rappelling and zip lining. Jumaring, a type of rock climbing using a jumar, is there for you to try too. It may seem harder, but it's worth all the effort. The basecamp comes with facilities for camping, day-outings, and even night-stays, so in case you are planning on spending the weekend out in the wilderness and with a side of adventure, you know who to hit up. Plus, corporate folks, be sure to pitch this place to your HR for your next off-site. None of that boring trust falls, just gear up and shoot your boss (with a paintball of course) or splash dirt on your work BFF at the ATV track. Opt for the night-stay option if you are looking for a fun weekend getaway as it comes with meals, accommodation (tents), and complementary activities.